Drumcore's come a long way, and version 3 makes it easier than ever to use pro drummer performances on your tracks. The two Drumcore components side by side. On the left is the newly developed plug‑in, while the Drumcore Toolkit stand‑alone program is on the right. Submersible Music's Drumcore combines an extensive drum sample library with in‑depth loop editing and auditioning tools, not to mention performances from some of the world's most famous drummers. Drumcore comes with 16GB of content spread over a wide range of musical styles, and additional 'Drummer Packs' are available at £63$79 each. Alternatively, you can opt for Drumcore Deluxe, which is the Drumcore software and an extra nine Drummer Packs, for £512$599. The new version of Drumcore has been split into two components, one functioning as a plug‑in and distinguished by a striking sunburst finish, the other a stand‑alone application referred to as the Drumcore Toolkit. 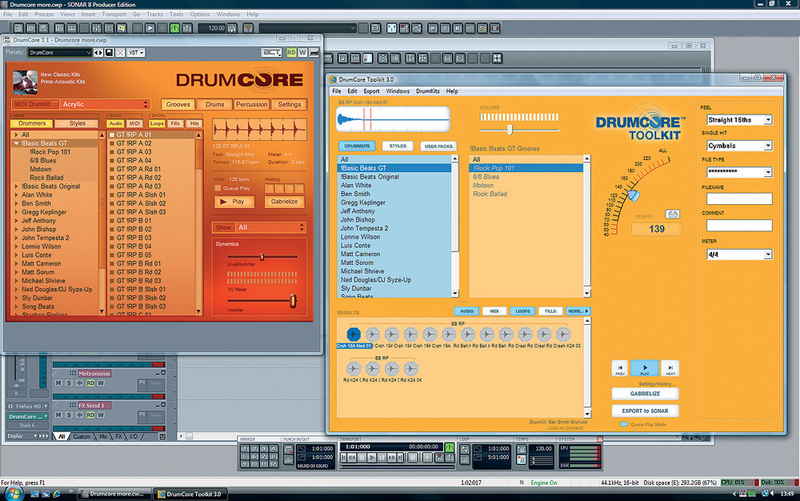 This Toolkit looks very much like the old Drumcore v2.5, in terms of both its colour scheme and its features, and this is more or less what it is. As Submersible explain, it is "a utility application for third‑party file importing and custom kit creation.” In other words, it can be used for importing audio and MIDI loop libraries, for building drum kits using WAV, AIFF, REX2 and ACID files, or as a sound source to be triggered live via a hardware controller. The plug‑in part, on the other hand, not only includes the audio content and some of the features of its stand‑alone counterpart, but also the fresh ideas recently premiered in Submersible's Kitcore v2 plug‑in. The Drumcore plug‑in is compatible with VST, RTAS and AU, and can be inserted into a sequencer track fairly seamlessly. The installation process uses five CD‑ROMs, the first of which establishes the location of the Toolkit and plug‑in, the rest carrying the actual content. Each 'Content Pack' has to be manually copied to the 'Pending Imports' folder created by the first CD. All told, this is a lengthy process requiring a drive with at least 16GB of free space. If any additional Drummer Packs are bought, there needs to be space for these too! Unlike Kitcore, or previous Drumcore products, version 3 does not use Rewire, and in my DAW (Sonar 8), it now appears in the VST plug‑ins list. Previously it was possible to synchronise the playback of a DAW and Drumcore via Rewire, by clicking a Tempo Sync button found in the lower left‑hand corner of the main screen. Unfortunately, this is missing in version 3, much to the annoyance of some users. The rest of the Toolkit application is very much like the previously reviewed Drumcore 2 (SOS December 2006), so it's the plug‑in element which is of most interest here. The Drumcore and Kitcore plug‑ins are very similar, the key difference being that Kitcore offers just MIDI data and sounds, whereas the former also provides the original audio loops and patterns that were used as the templates for the MIDI files. There are a few other additions ported across from the stand‑alone component, the most notable of which is the random loop-generating 'Gabrielize' feature, and a search filter for identifying single hits. Drumcore clearly takes a lot of inspiration from Kitcore, also adopting its List View and Live Drummer functions. The former usefully arranges content into song‑like sets of related loops, fills and variations, while the latter provides a means of adjusting the feel of the MIDI patterns, enabling the user to adjust the relative dynamics of the individual hits by moving a slider. Previous Drumcore and Kitcore reviews have detailed the range of drummers and material thoroughly (see our Kitcore review in the May 2009 issue of SOS), and the full list of participants, plus demos of their work, can be found on Submersible's web site, so suffice it to say here that there is an extremely impressive and diverse list of musicians providing the library's standard content. Asfor that content, it is of a very high quality, as one might expect. Version 3 expands further the Basic Beats section where bread‑and‑butter songwriting material can be found, increasing the number of intros and endings. Further to that, the Urban GT expansion pack, providing hip‑hop and R&B MIDI grooves and 24 drum kits, is now included as standard, and Gregg Keplinger has given his talents to bolster the library's jazz content. Other newly standardised drum kits and grooves include those of Matt Cameron (Soundgarden, Pearl Jam) and the entire Tempesta Pack II, by John Tempesta (Rob Zombie, Testament, Helmet). The content as a whole is still mainly provided by drummers working in styles that represent the US market, so one criticism, particularly from a UK perspective, is that the range is not yet comprehensive enough. In this screen, showing the drum pad page, the current drum kit is that of Jeff Anthony, as indicated at the top left, but Lonnie Wilson has been selected from the main menu of drummers. A submenu offers 12 kit variations. 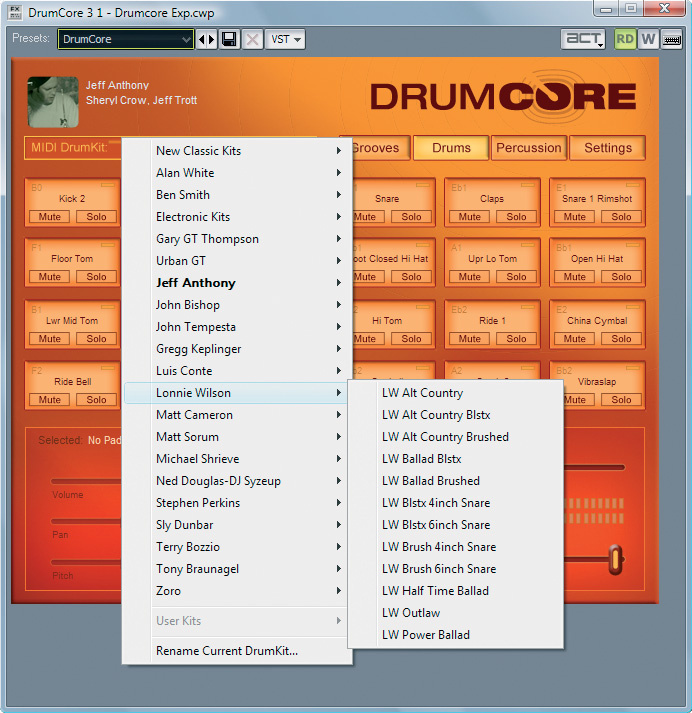 Drumcore was originally conceived as a librarian program for keeping track of drum samples and loops, and it is this functionality that still strongly informs the design. Submersible know that their strength lies in the provision of specific content from the world's top drummers, and so their interface delivers this in the most efficient way possible. That said, at a stretch Drumcore can still be though of as a software instrument that provides an extensive menu of sounds, loops, fills and hits, plus some useful controllers and editing tools — it does, after all, have a kit editor where sample layers, amongst other things, can be edited for each sound. In practice, there is no reason why one cannot be scouring the library for stylistic content one moment, then auditioning the work of a particular drummer the next. Things start to get more interesting if styles and sounds are mixed up so that, say, a set of patterns and fills created by a heavy rock drummer are played on the kit of a jazz specialist. Further more, Drumcore's design makes it easy to drag matching audio and MIDI patterns straight into a sequencer so that alternative drum sounds can be layered with the recorded ones. If, for example, you have selected a Ben Smith audio pattern in the Loops menu and want to use it, but fancy hearing how it might sound on a Sly Dunbar kit, this can be achieved in a matter of seconds by selecting a different MIDI kit and then toggling the Mode button over from Audio to MIDI. Creating a plug‑in version of Drumcore was the most logical thing Submersible could have done after Kitcore. It's great that the stand‑alone version is still part of the deal, as it still has specific uses, although the missing tempo sync, apparently to be reinstated in a future free upgrade, is annoying when you're loop auditioning. Competing products such as FXpansion's BFD2 certainly offer more control, in terms of everything from editing the tuning of each drum to the virtual placement of microphones, but Drumcore isn't really intended for that sort of thing. Instead, it aims to provide the means of finding the right thing, fully formed, within its library. 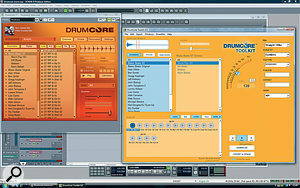 Those musicians with plenty of time on their hands may wish to look elsewhere for programs with more editable features, but for the rest of us, who frequently find ourselves wondering where the day has gone, Drumcore offers an attractive way of assembling a great‑sounding rhythm track in a short time. Personally, I love the elegant simplicity, and the only additional feature I'd like to see is a MIDI editor for creating and saving custom adaptations of patterns before export. Submersible have clearly been learning and improving their products with each new release, but the recent news that the company has been bought by (Riff Works and Instant Drummer creators) Sonoma Wire Works means that things are sure to change in some way. Let's hope it's for the good. Drumcore faces competition from FXpansion BFD2, Spectrasonics Stylus RMX and NI Battery 3. Each of these approaches the task from a very different angle, so which is the best for you really does depend on your working methods. BFD2 offers lots of control over the production of sounds and drum mixes, while Battery 3 is very much about sampling and synth‑style sound manipulation. Stylus RMX is arguably a little closer to Drumcore and offers a 'Chaos Designer' (which is somewhat akin to Drumcore's Gabrielize feature), and the sort of groove control provided by Live Drummer. What sets Drumcore apart from the others is its drummer content. Offers a means of using the work of great drummers. Loads of MIDI and audio content to play with. Tempo Sync is gone from the Tool Kit. Some users will want more editing options. The range of drummer contributions is still very biased towards the US. Drumcore now includes all that's good about Kitcore. It's a very efficient tool for auditioning MIDI and audio drum loops, but the impressive library of content, provided by many of the world's best drummers, is the most appealing. Drumcore £197.24; upgrade from previous versions, £39.45; Drumcore Deluxe, £512.81. Prices include VAT. Computer Warehouse Pro +44 (0)20 8400 1234. $249. Upgrade from previous versions, $50. Drumcore Deluxe, $599. Intel Core 2 Quad Q6600 PC with 4GB RAM, running Windows Vista Home Premium. Cakewalk Sonar 8 Producer Edition.